Speed up as you approach a school –really? The signs say ’30, 20 zone ends’ — you can see them in Blinco Grove, Hartington Grove and Hinton Avenue. The sign in the picture is in Blinco Grove, home to Morley Memorial Primary School. Why are our streets still 30mph while streets on the other side of Cherry Hinton Road are 20mph? The speed limit is changing throughout Cambridge, following last year’s citywide consultation on a change to 20mph, to improve safety for pedestrians and cyclists. 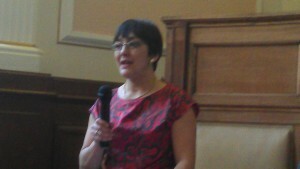 That resulted in a public vote of confidence for changing the limit to 20mph in most residential streets. The implementation of the 2omph project is being rolled out in four phases. The east area is being done now, and as part of their signage, the Council is installing signs like the one pictured. 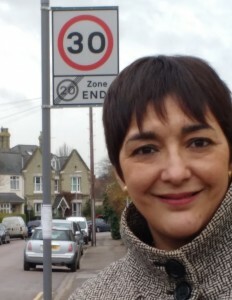 But many Queen Edith’s residents have said the signs virtually invite cars to speed into streets such as Blinco Grove, Hartington Grove and Hinton Avenue. Ironically, these streets are used by vulnerable road users, such as children going to Morley Memorial Primary School – just the people the 20mph limit is intended to protect. People are already reporting cars speeding up as they exit Cherry Hinton Road, egged on by the signage. One parent of young children has described it as ‘terrifying’ to have cars ‘belting down’ our roads, as they rat-run between Cherry Hinton and Hills Roads. Queen Edith’s should be 20 too by next spring or summer, subject to the traffic regulation orders going through. That’s a long time, plenty long enough for an accident. It would be horrible if an initiative to improve road safety results in an accident because of the timelag. I have asked the Council to address this unintended consequence. We hope they can come up with a solution.